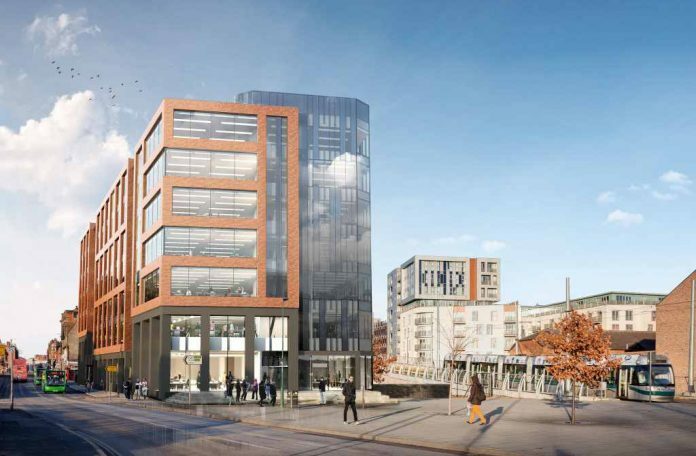 A planning application for a new 7 storey, 1,000 desk Grade A office block in the Southside area of Nottingham city centre has been submitted. The initial proposal for the new site was announced at MIPIM as another next step in the regeneration of Nottingham’s Southside area. The proposal by Nottingham City Council will transform the Crocus Place site on the south east junction of Arkwright Street and Crocus Street. The site was used as a base of operations for the NET lines 2 and 3 construction and now sits in a key location for office space in the city. “Having worked in the city for more than 25 years, we have become experts in combining modern with traditional in order to enhance the local heritage while also creating stylish developments.